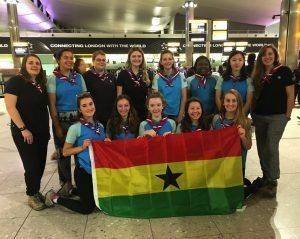 to join a group of Guides and visit Ghana, where amongst other things volunteering on projects in schools was undertaken. A diary of the visit is provided below. 4am the team met at Heathrow airport, we said our goodbyes to family after lots of group photos! Heathrow to Istanbul to Accra.Arrived at 6pm and were met by our in CountryHosts in Accra Airport. Cape Coast Castle.We travelled 4 hours from Accra to experience this historical location. Took part in an amazing tour to learn all about the slave trade in Ghana. Trip to Kakum National Park to experience the canopy walks over the forest. 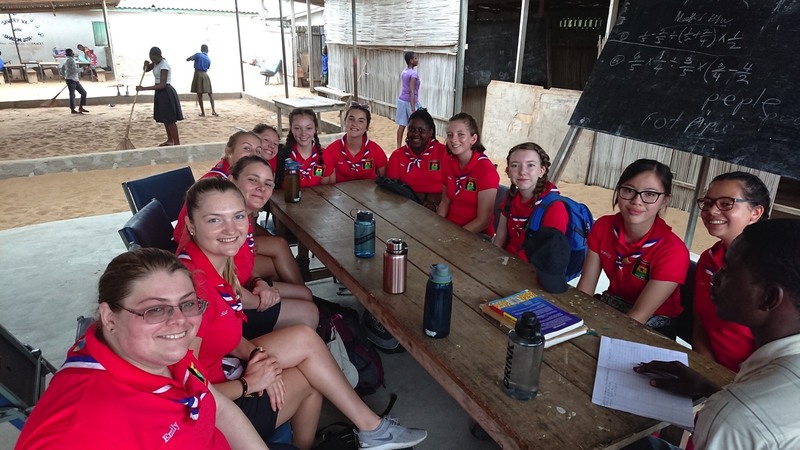 We crossed 7 bridges in total, fortunately we had no issues in the team with heights!After our first weekend in Country, we then travelled a long 9 hours to our volunteer accommodation in Woe. 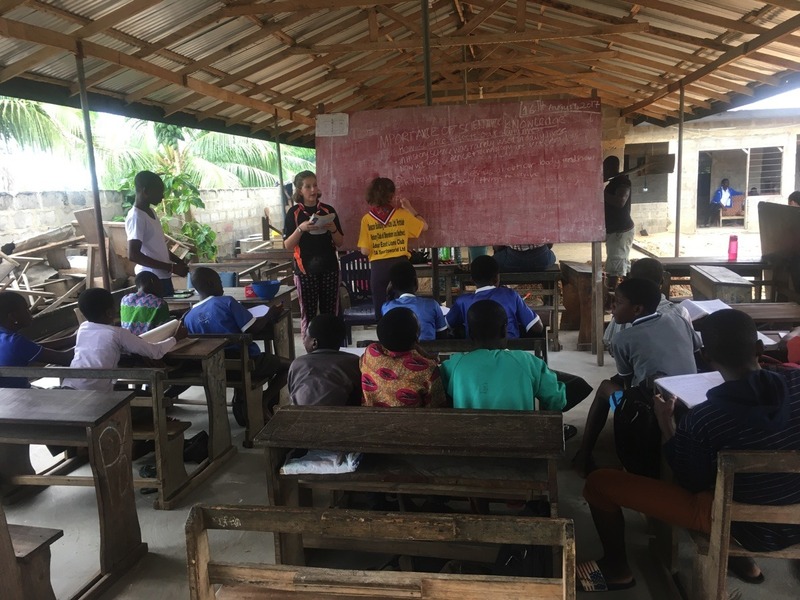 Our first day at our volunteer project at Shalom School.We met all the staff and students, observing typical lessons.Break time was spent getting to know the children, playing games and taking photos!After our project day we walked to a local lighthouse and paddled in the sea. Back at school today, the group split between Teaching and Construction. I was in the Teaching Team today, and it was informal letter writing for some seniors and learning numbers with the younger class.The other team were making a start on concreting part of the school classroom. Our afterschool activity was Ewe, local language lessons! My 2nd day of teaching at the school, with a Science lesson with the senior class, and after lunch teaching 5to8 year olds all about parts of the body! Progress was being made on the concreting by the other group.After school we went to a local market, it was so busy, and we attracted lot of shouts “yevu” (foreigner) from the locals. A local seamstress visited us in the evening to measure us up for some hand made trousers! Today at School, the teams swapped projects, so it was my turn for some concreting. There was a lot of moving rubble, and mixing concrete by hand, a lot more physical that we had thought, but great fun! 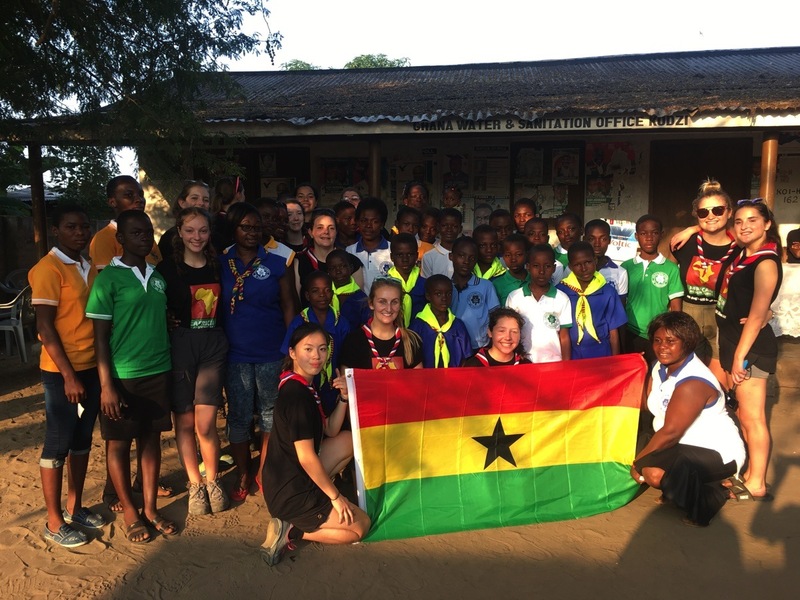 After the project day we learnt about Ghanaian culture and marriage from a local resident. It was PE with the school, so we met the whole school at the beach for games and races. We walked back to the school about 20minutes away. After school we took a tour around the local community, such a wide variety of crops being grown and different styles of homes. Our 2nd weekend away took us 5 hours north to the Volta Region. We visited the Tafi Atome Monkey Sanctuary, and got to feed the Mona monkeys.We all dressed up for our evening meal of pizza and ice cream at our hotel. 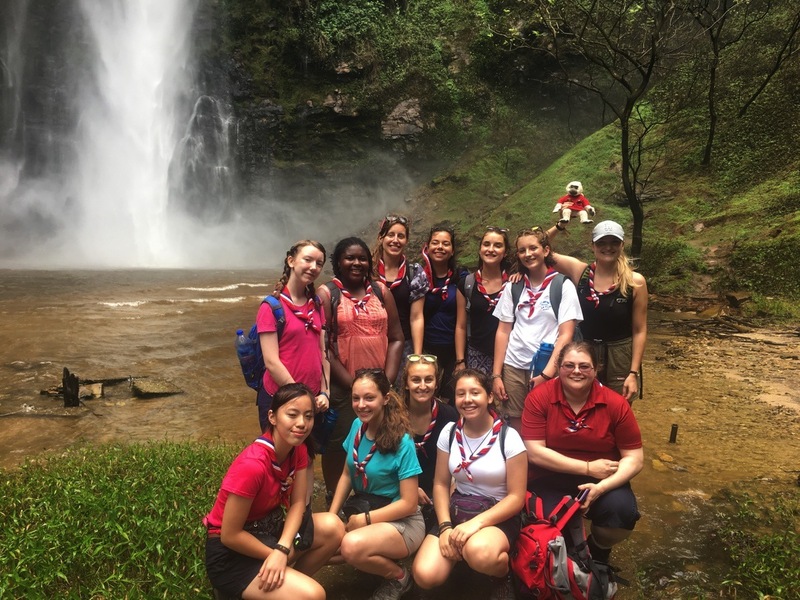 A trip to the jungle to visit Wli waterfall. I stayed back at the hotel after not feeling too great.After lunch we headed back to the Volunteer house with more singing in the bus to keep us entertained! This was our last day of project work at the school. The Leader Team finished off the last of the concreting, whilst the girls taught their last lessons. What an amazing achievement completing the floor of the classroom, and some great skills learnt too.There was another trip to the beach and a local lagoon after school. The seamstress arrived with our trousers in the evening, we were all very excited! Our last full day in Ghana, and it was the best day EVER!! 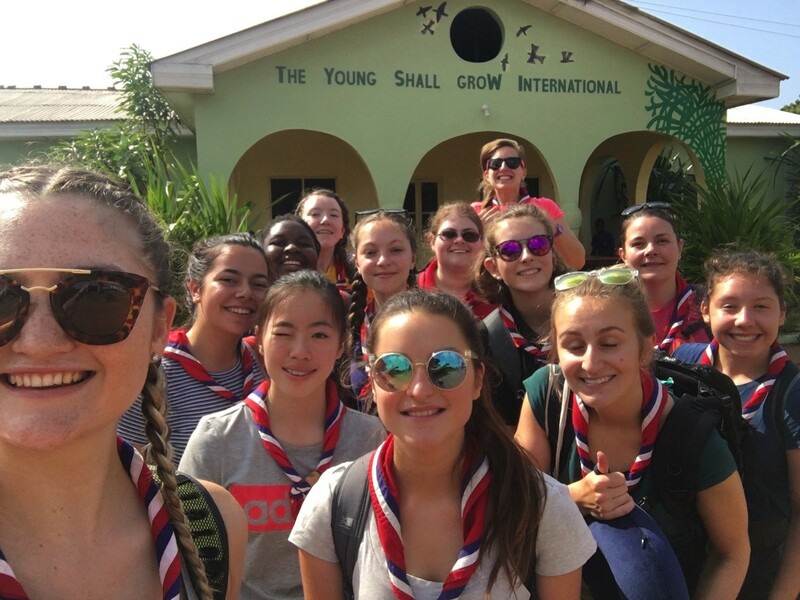 Our final day at the school, we spent the first 2 lessons starting up a Guiding Group, with games, songs and craft. The older group of girls we ran a lesson on Gender stereotypes which was really empowering to see their passion for life. A farewell presentation with dancing and drumming from the students ended our time at the school. In the afternoon my wishes came true, we met a Girlguiding group in a village 45 minutes away. They greeted us at the edge of the village and paraded us along with the Local Scouts to the centre of the village where we were welcomed with singing & dancing. Our final morning at the volunteer house, was full of goodbyes to the local children and our hosts, we were presented with some amazing personalised scarves and gifts. We gave a donation of gifts for the community. A few more group photos before our 4 hour trip back to the airport.